On December 30th 2016 Air Baltic brought it´s newest aircraft, the Bombardier CSeries CS300 with flight number BT433 from Riga to Vienna. It has landed at 6:01 p.m. on runway 34. 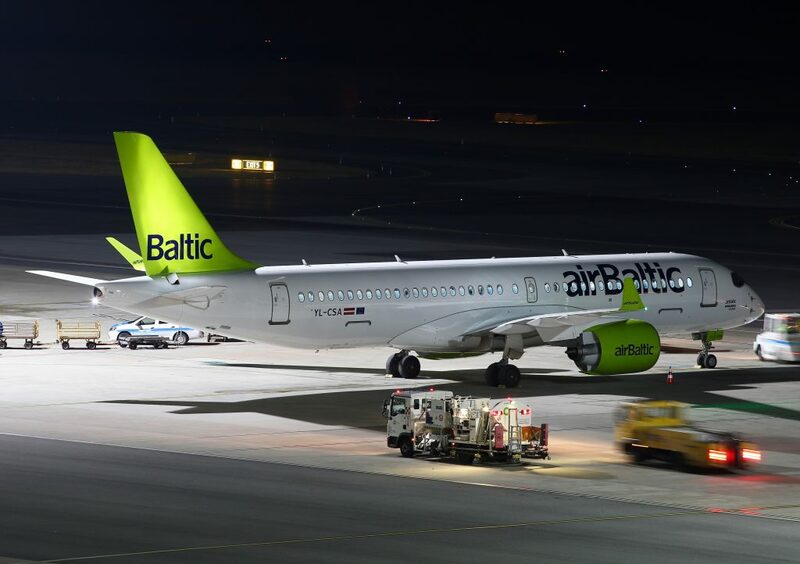 The aircraft with the registration YL-CSA was delivered to Air Baltic on November 28th 2016. The “unofficial” first landing of this new aircraft type in Vienna was on December 23rd 2016, because of an necessary airplane change. For December 29th 2016 the „official“ first landing of an CS300 at the Vienna airport was planned, but was canceled due to flight plan changes because of heavy fog in Paris. The “official” first landing with press event is scheduled for mid of January now. Air Baltic, the first operator of the CS300, has ordered 20 airplanes of this type to replace the aged Boeing 737 fleet. The Bombardier CSeries CS300 is the newest and most modern airplane for short and mid range flights.